WEDNESDAY MAY 2 In the end, the only thing that could cool off the Westchester Community College Baseball Team was … the heat. A season-high seven-game winning streak ended on Wednesday as the Vikings lost 12-7 to Sullivan Community College during a game played at Sullivan. With the loss, Westchester falls to 21-10 overall, and 13-3 in both Region XV and Mid-Hudson Conference play. Despite the loss, Westchester still holds the tiebreaker for first place in both the conference and Region XV heading into the final regular season weekend of play. After winning the first three games of the series thanks in large part to dominant pitching, Sullivan finally got their bats going during a make-up game on Wednesday, scoring eight runs over the first two innings to break open a 2-2 tie, and all put the game away for good. The Vikings hurt by uncharacteristic poor play in the field, committing five errors and allowing six unearned runs. Jose Delacruz (New York, NY/George Washington HS) continued his fine recent play, going 2 for 4 with two RBI’s and a run scored, including his third home run of the season. He also allowed only one earned run over two innings of work on the mound, and struck out two batters. Also for Westchester, catcher Andy Iglesias (White Plains, NY/White Plains HS) went 1 for 3 with a walk and two RBI’s, while Scottie Giordano (Croton, NY/Croton-on-Hudson HS) went 1 for 3 with three walks and two runs scored. THURSDAY MAY 3 If the Westchester Community College Baseball team is to capture the Region XV Championship for the fifth straight season, this might be the game they will remember as the one that proved they had the goods to overcome anything to be a champion. For so long, nothing went right. Even when things seemed to be going right, the Vikings found ways to squander opportunities. However with the 13-12 win, the Vikings improve to 22-10 for the 2018 season, having won seven of their last eight games. More importantly, WCC is now one win over Rockland away from clinching the Mid-Hudson Conference Championship, and earning the top seed for next weekend’s Region XV Championships. The two teams play each other one more time in Valhalla on Friday at 3:30 p.m., and twice at Rockland on Saturday to close the 2018 regular season. At no point was this game comfortable for either team, both figuratively and literally. After spending much of the season playing in winter-like conditions, the teams played in August heat on Thursday as temperatures approached triple digits, and humidity levels soared. The heat affected the game significantly as two teams known for stout defense and solid pitching combined for 20 walks, 3 hit batsmen, and 4 errors. The result was a game that was sloppy at times, but thrilling almost every pitch. Westchester trailed 4-3 heading into the bottom of the fourth inning, when the Vikings rallied for four runs to take the lead. Osorio walked, and was brought home when Scottie Giordano (Croton on Hudson, NY/Croton HS) launched a home run to right field to give WCC a 5-4 lead. James Houlahan (Yorktown Heights, NY/Lakeland HS) reached on an error, and with two outs, Bobby Wootten (Ardsley, NY/Ardsley HS) drilled a pitch into the right centerfield gap to bring Houlahan all the way around to score for a 6-4 lead. A CJ Sager (Mahopac, NY/Mahopac HS) single brought Wootten home for a 7-4 lead. Rockland would not go down quietly as the Hawks scored a run in the fifth inning, and four more times during the sixth inning to go ahead 9-7 as the Vikings pitching staff struggled with control. In the bottom of the seventh inning, WCC erupted for five more runs to storm ahead again. Giordano doubled with the bases loaded to drive in two runs and a Paul Franzese (Somers, NY/Somers HS) single scored Giordano to make it 11-9. Wooten singled home Franzese for a 12-9 lead, and the Vikings seemed to be in command. However, the lead was short lived as Rockland battled back for three runs without a single hit during the top of the eighth inning to tie the game at 12. Giordano, who walked four batters during the eighth inning, remained on the mound for the ninth inning, and held the fort, allowing a potential go-ahead double, but nothing else. That set the stage for Osorio and company to send fans home happy, in walk-off fashion. Christian Lovecchio (North White Plains, NY/Valhalla HS) opened up with a hit by pitch, but was retired on a fielder’s choice by Wootten, who beat the throw to first. A Sager walk moved Wootten to second base. With two outs, Sean Vanegas (Bronx, NY/Mount St. Michael) walked to load the bases, bringing up Osorio. A pitch hit the WCC shortstop, driving in the winning run. The walk-off RBI was Osorio’s second of the season as he singled home the winning run in the bottom of the 10th inning during a 5-4 win over Suffolk Community College on March 28. Giordano went 2 for 3 with four RBI’s, two walks, and three runs scored. He also allowed only a single run during two innings of work on the mound to earn his third win of the 2018 season. Also for Westchester, Franzese and Wootten each went 2 for 6. Franzese drove home a run and scored a run, while Wootten scored twice and drove in three. Sager went 2 for 4 with two walks. Osorio, who played the hero role in the end, went 2 for 4 with a walk, scored twice, and drove in two runs. SATURDAY MAY 5 In a year that has seen more than a share of improbable endings, instead of waiting for late-game heroics to dictate the day on Saturday, the Westchester Community Baseball team improbably left no doubt. And as a result of 14-2 and 12-8 wins over Rockland Community College to sweep the season series, the Vikings clinched the 2018 Mid-Hudson Conference Championship, and improved to 25-10 overall. The Conference Championship is Westchester’s fourth straight, seventh during the last eight seasons, and 14th Mid-Hudson Conference Crown. Where the first two games of the series featured walk-off wins for the Vikings on Thursday and Friday, Saturday’s games took on a decidedly different tone, as Max Marienberg (Scarsdale, NY/Scarsdale HS) took to the mound for the opener, and completely shut down the potent Rockland line-up until the Westchester bats could heat up. The freshman lefty entered the fifth inning with a no-hitter, and turned in his most dominant performance of the season, improving to 3-0, and giving the WCC bullpen some much-needed rest. With Westchester leading by 13 runs entering the bottom of the fifth inning, Marienberg had a chance to complete his first career no-hitter, but with one out the Hawks were able to get their first hit of the game. Otherwise, Marienberg was outstanding on a day when his team needed it. Once the Viking bats got going, Westchester had a huge day at the plate, scoring twice in the third inning, and nine more times during the fourth inning to break the game wide open. The fourth inning was highlighted by three consecutive bases-loaded walks, and a two-run homerun by Scottie Giordano (Croton, NY/Croton HS) that made it an 11-0 game. Rockland scored a run without benefit of a hit during the bottom of the fourth inning to make it 11-1, but Jose Delacruz (New York, NY/George Washington HS) put any hopes of a comeback away in the bottom of the frame, blasting a three-run homerun to right field for a 14-1 lead. Marienberg faced some trouble in the fifth inning, and allowed a run, but ended the game early as the Vikings took advantage of the Region XV mercy rule, winning the game in five innings. Delacruz had four RBI’s, while Giordano had two hits, two RBI’s, and scored twice. Also for WCC, Paul Franzese (Somers, NY/Somers HS) and Christian Lovecchio (North White Plains, NY/Valhalla HS) each had two hits. The nightcap was meaningless in terms of standings and regional seedings, but it did represent the 25th win of the season for the Vikings. Chris Cipriano (Irvington, NY/Dobbs Ferry HS) had a huge day at the plate, going 3 for 4 with three RBI’s and two runs scored, while Andy Iglesias (White Plains, NY/White Plains HS) went 2 for 5 with three RBI’s, including a double. Also for Westchester, Giordano, Sean Vanegas (Bronx, NY/Mount St. Michael), and Bobby Wootten (Ardsley, NY/Ardsley HS) collected two hits apiece. Triston Olmo (Ardsley, NY/Ardsley HS) picked up his third win of the season, while CJ Sager (Mahopac, NY/Mahopac HS) made his second appearance of the season, and picked up a save. With the regular season behind them, Westchester Community College is the top seed for the Region XV Championships, which begin on Thursday, May 10 at Rockland Community College. MONDAY APRIL 30 For the first time this season, Westchester Community College Golfer Andy Perez (Ossining, NY/Ossining HS) did not finish atop the leader board at an event during the Mid-Hudson Conference Invitational on Monday at the Wallkill Golf Club in Middletown, New York. But if there is good news, another Viking stepped up to turn in a career performance, giving Westchester yet another weapon as the 2018 campaign speeds towards the postseason. Joseph Danko (Yorktown Heights, NY/Somers HS) joined Perez in shooting an 87 – one stroke behind the leader for second place – as Westchester Community College finished in second place as a team, finishing just behind Orange Community College. The Vikings shot a 376. However, the most important news is that the emergence of Danko gives Westchester a strong chance as the Conference Championships are only two weeks away. With their performance on Monday, Westchester maintains first place in Mid-Hudson Conference play with 13 points, while Orange Community College sits in second place with 10 points. Also for Westchester on Monday, Matthew Rice (Lagrangeville, NY/Arlington HS) shot a 108, while Moises Alvarez (New Rochelle, NY/New Rochelle HS) shot a 110. THURSDAY MAY 3 On the stat sheet, Westchester Community College freshman Matthew Rice (Lagrangeville, NY/Arlington HS) shot a 107 on Thursday during the Mid-Hudson Conference Golf Invitational at Spook Rock Golf Course in Suffern, New York to finish closer to the bottom of the final standings than he did to the top of the standings. Lining up for the final hole of the day for any Viking golfer, Rice teed off during a torrential downpour that would – and actually did – send most running for the clubhouse. Despite the deluge of rain and a fierce wind that accompanied a late day storm, Rice powered through the 18th hole, sunk his final put, and allowed Westchester to achieve a team score. By virtue of completing a full team round, Westchester Community College earned enough points to remain in first place in the Mid-Hudson Conference standings. The Vikings, who shot a 376 to finish in second place behind Rockland CC on Thursday, now have 17 points this season, five points ahead of second-place – who won Thursday’s event with a season-best 369 – with two events remaining. WCC enters the home stretch of the season in the driver’s seat for the conference crown. A strong showing during the May 10 and May 14 Mid-Hudson Conference events will give the Vikings a Conference Championship yet again. 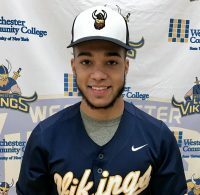 Thursday’s tournament was also noteworthy for Westchester as a Viking not named Andy Perez (Ossining, NY/Ossining HS) finished atop the Westchester leader-board. This time around, it was the surging Joseph Danko (Yorktown Heights, NY/Somers HS) who won the day for WCC, finishing with a career-best 84 to earn second place for the event, a mere four strokes behind the tournament champion from Rockland Community College. Danko has come on incredibly strong during the latter part of the season. After opening the 2018 campaign with a 95 during an event at the Woodstock Golf Course on April 23, Danko has steadily improved his game, shaving 11 strokes off his first event of the season, and he is heating up at the right time. Perez was his usual solid self on Thursday, finishing one stroke behind Danko – and in third place overall – with an 85. Also for Westchester, Cian Guilfoyle shot an even 100.
shooting an 83 as Westchester finished a mere 11 strokes behind the winning program, Orange Community College. It is clear that Westchester CC sophomore Andy Perez (OSSINING, NY/OSSINING HS) is on par for one of the best individual season in recent memory. After leading the vikings to a first and second place finish during a three-day span, Pereze became the Mid-Hudson Conference Athlete of the Week. Perez’s outstanding play began on Monday, April 23 when WCC finished in second place at the MHC Invitational at the Wiltwyck Gardens Golf Course in Kingston, NY. During the event, Perez was the top individual finishes, shooting an 83 as WCC finished a mere 11 strokes behind the winning program, SUNY Orange. On Thursday, April 26, Perez led the Vikings to a first place finish during the MHC Invitational at Hickory Hill Golf Course in Warwick NY. The Vikings defeated second place Rockland by six strokes, improving by 14 strokes as a team during a 72-hour span. Perez was victorious once again, shooting an 84. SATURDAY, MAY 5 – Freshmen Alysha Owens and Jonathan Sherman each enjoyed a terrific day of competition, leading WCC Track & Field tram during the program’s final event of their inaugural season on Saturday during the Tom Farrell Track & Field Classic at St. John’s University. The event featured not only several community college Track & Field programs, but also multiple NCAA programs, including York College, Lehman and Division I Team, St. John’s. Owens was outstanding in field events, finishing ninth during the javelin throw (23.11 meters) , and then earning a 10th place finish in the shot put (9.94 meters). Also on the women’s side, Mia Colon competed in two evetns and finished as high as 17th in the 1500-meter run (6:30.77) while Doris Austin-Brooks competed in three events, and her day was highlighted by an 11th place during the 100-meter hurdles (18.92). On the men’s side, Sherman continued his outstanding 2018 campaign, finishing sixth in long jump (6.10 meters) while Giovani Castillo competed in two events, earning a 16th place in the javelin throw (19.23 meters) and a 14th place finish in the shot-put (7.92 meters). With the completion of the four-competition schedule during their inaugural season as a club program, Westchester will aspire to elevate the program to varsity status which could come as early as the spring of 2019.